I'm alive! Sorry for the blogging hiatus folks. My wonderful boyfriend whisked me away to sunny Cuba for my birthday this year. Aren't I a lucky girl? We left during the biggest snow storm of the year and landed in a sunny, sandy paradise. Life can't get much better than that. We didn't take very many pictures. Perhaps we were so relaxed that we didn't even want to reach for the camera. Or perhaps we wanted to spare blinding you with our pale Canadian skin in bathing suits. Nevertheless, here are a few. 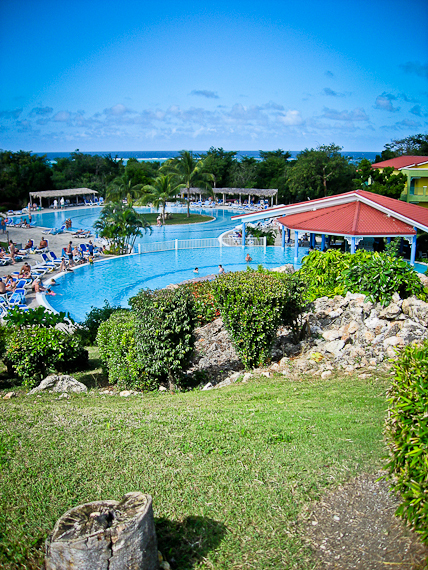 Our resort, the Sirenis Playa Turquesa, was a beautiful oasis with no less than five pools, five restaurants, at least six bars, a private beach, and on and on and on. The food was great, the drinks were endless, our room was clean and quiet and the atmosphere was whatever you wanted it to be. By the third day in we may as well have been jellyfish. It wasn't all napping and sunning at the Sirenis. There were plenty of recreational activities to keep you occupied. 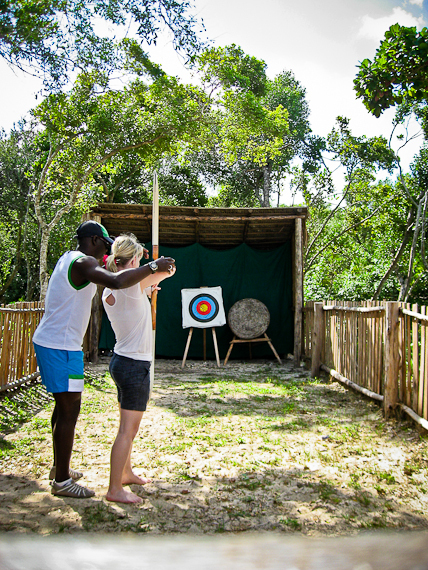 I, for one, managed to learn a new sport - archery! I must have had beginner's luck, because I came in second place in our mini tournament! Yay me! The suave archery coach, Danny, also provided lively afternoon poolside entertainment. His catch phrase "I love you more!" is perhaps our favourite souvenir from the trip. They gave you every reason not to leave the compound, but we were rebels. 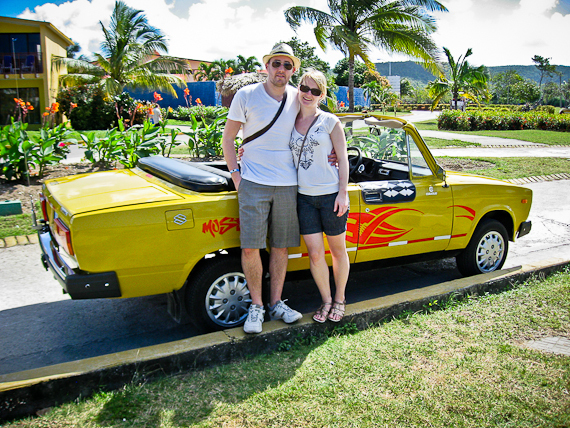 Here is the super cool cab we took to "the town", which was actually a vendors' market set up outside a group of resorts. Ha! It was worth the trip, however, for the pile of shell jewellery I managed to get for a steal without bargaining at all and the interesting characters we shared a drink (or two or three) with. Another day trip was to the city of Holguin. 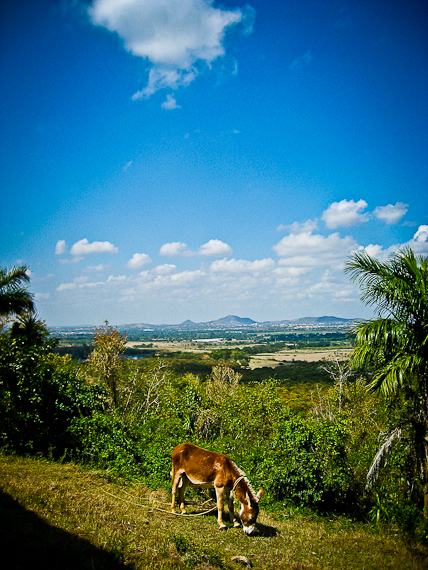 Auberto ushered us around in a 1950s Ford on a tour that included a beer-drinking donkey, coffee at his mother-in-law's home, freshly squeezed sugar cane juice, and pork sandwiches. 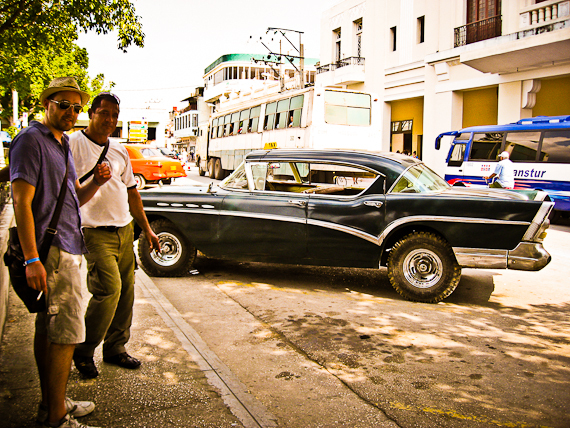 It was an amazing glimpse into real Cuban life. Although, I probably would have been content just gazing out the car window at the lush rolling hills of the countryside. The city architecture wasn't too shabby either... or it was, but that was the beauty of it. 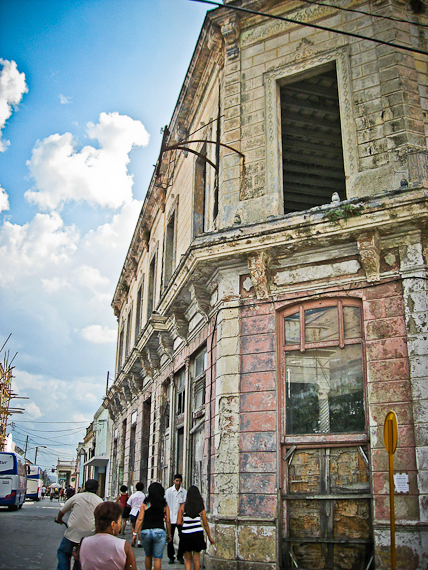 I wish we had a little more time to explore here on our own, but sometimes you can't escape the kindness of Cubans. Maybe next time. Thank you Auberto! Coming back was a definitely a culture shock, but discovering all the Dear Edna orders that came in while I was away helped ease the pain. Spring wedding season has sprung! Which explains the rest of my absence. I've been up to my ears painting and sewing ever since I got back. I've also been experimenting with screen printing in the midst of all of these orders. In short, it's not as easy as it looks. But that's a story for another day. Your pictures look great! I also really like your shorts - they seem to be the perfect length!